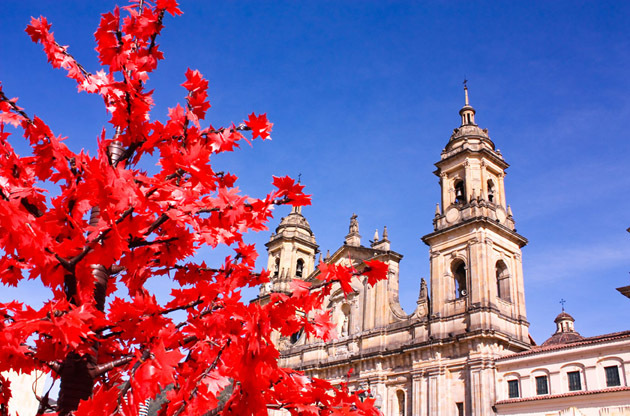 The Colombian capital Bogota is a great destination to go for anyone who is interested in South American culture. It is the main hub for all sorts of activities, culture and arts in Colombia and has got a special place among the other South American capitals as it connects the old and the new in a harmonious way. Bogota is a big city and it is divided into 4 sections and in total has got 20 localities. Home to almost 8.8 million people, this striking city attracts thousands of tourists every year. In addition, it is the main destination for a lot of Colombians living in different cities in the country to have fun at the weekends. Of course, the city is visited by a large number of Colombians for business purposes during the week as well. The splendid Andes Mountains constitute the setting of Bogota, they can be seen from every part of the city. The weather of the city may be described somewhere between spring and fall all the time. Although the temperature scarcely falls out of the expected, you may encounter heavy rain in the middle of a sunny day. Another thing to be mentioned about Bogota is that it is a city that has multiple layers. After exploring a historical church, you may come across to a skyscraper look like mall. Or just across the restaurant where you taste the best dishes from the Colombian cuisine, there may be an old building which may give you the creeps. However, this layered texture of the city what makes it this authentic. Bogota, both with the attractions it has and the cultural heritage it has been successful to preserve really well is a city that will make you feel alive. In addition, witnessing the heartwarming sincerity of the locals (they are called ‘rolos’) will make your stay even better. No matter what happens, Bogota will stay in your heart for good. Bogota is located in the middle of Colombia, at 2.600 m above the sea level. How to get to Bogota? Bogota’s international airport, El Dorado International Airport is located 15 km west of the city center. The options for airport transport is given on El Dorado Airport’s official website . How to get around Bogota? Bogota has an adequate public transport system. Especially, the TransMilenio has made the daily lives of the Bogota people a lot easier. However we should also mention the quality and the speed of the other vehicles in the traffic, such as the buses; lower your expectations as much as you can. The information regarding the routes, maps and schedule for all the public transportation can be found on SITP , Bogota’s public transportation operator. Taxis in Bogota; to take or not to take? That is really the question in Bogota. Unfortunately the cab drivers in Bogota are notorious for overcharging the passengers, not usually but always. There are also cases of mugging, insult and injury. When we take into account the reckless driving habits of the drivers, taking a taxi doesn’t seem that sensible in Bogota. However, if you really have to or you want to take one, then make sure you call a cab; don’t think about stopping a random one from the street. You can take a safe one’s number from your hotel in most cases. From museums to points of interest, parks to gardens, restaurants to bars, Bogota has got anything you may want to have during your trip. If you feel like going out of the city for a couple of days, then there are a bunch of alternatives as beautiful as Bogota, too. Casa de Moneda, Emerald Museum, Museum of Colonial Art, Museo Nacional, Museum of Modern Art of Bogota and Museo Botero are the ones that would be really interesting to see if you are a museum lover. Most of them are located in La Candelaria area, which is also the place where you can find the historical churches and buildings. La Catedral, Iglesia Del Carmen, Biblioteca Luis A Arango, Plaza de Bolivar, Cerro de Monserrate, Torre Colpatria, Planetario Distrital and Hacienda Santa Bárbara are the main points of interest in Bogota that attract a lot of visitors every day. Note that these are located in different sections of the city, so a planning may be useful beforehand. Well, if you are after fine dining and a shiny night life, then I am happy to tell you that there couldn’t possibly be a better place for you to visit. What is more, most of the exclusive restaurants and popular clubs, bars and pubs are located at the same or nearby areas, so you don’t have to worry about reaching one district to another. 93 Park or Parque de la 93 is the area where you can find anything regarding food and fun. The surrounding areas of the park are called Zona Rosa, and let me tell you, it is filled up with a lot of places to have some delicious Colombian cuisine and some fun. La Macarena is the uprising bohemian corner or the city and has got many stylish bars and clubs. It is you in Bogota to decide which way you want to shop. You can get lost in the long and shiny corridors of big malls or you can have fun while bargaining at the street markets. All you have to think about is to have an extra bag for all the beautiful things you will buy. Usaquen district is famous for the biggest flea market in the city. It is a market that has everything in one place: leather goods, second hand books, Colombian hand woven rucksacks and so much more are sold in the market. San Andresito is a bit far away from the city center, however the prices in the area are a bit cheaper and the variety of the goods are literally countless. There are more than 70 shopping malls in the city and most of them are accessible by public transport. Colombian Coffee tours are really popular among the travelers in Bogota. Watching a game in El Campin Stadium is quite an experience if you can catch one. Hiking in the wetlands of the Sabana de Bogota and Avenida Septima, the regular street shows of every Friday and Saturday may be considered when in Bogota. Bogota is becoming a more important city in the world’s event tourism scene when the number of the international events that take place in the city is considered. Large scale congresses, conferences, symposiums, exhibitions, tradeshows and fairs are held every year in Bogota. The attendees enjoy both participating in their desired event and exploring this beautiful city.